INDE – Rajastan - The six forts include Chittaurgarh, Kumbhalgarh, Ranthambore, Jaisalmer, Amber and Gagron in the districts of Chittaurgarh, Rajsamand, Sawai Madhopur, Jaisalmer, Jaipur and Jhalawar respectively. The Archaeological Survey of India (ASI) protects the first three while the rest are under Rajasthan government's Archaeology Department. These forts – located on the rocky outcrop of the Aravali mountain range – date back to 8th – 19th centuries and represent "military hill architecture" of the Rajputs. Unesco gave approval to India's proposal at its 37th meeting currently being held at Phnom Penh. India currently has 29 World Heritage Sites, including six in natural category and rest in cultural. ROYAUME UNI – Kidderminster – A radar survey of the churchyard in 2006, as part of the first stage of the Historic Kidderminster Project, found evidence of a structure several feet underground a few yards from the northside of the church. Mr Gilbert said: “We are confident about finding something but we are trying to keep our sense of excitement under control. 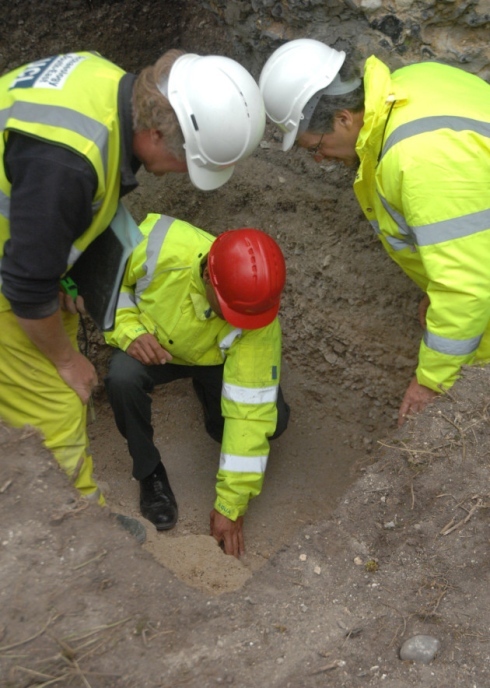 We know something is there and it would be fantastic if there is evidence of a Saxon monastery. “There is understood to be a medieval chapel under the churchyard so it could be that. We know there is something there but what it is remains to be seen.” A Saxon deed from the year 736 refers to a monastery builtin the area. A 19th century town historian, the Rev John Burton, believed it was destroyed by Danish Vikings on their way to Bridgnorth. USA – Beaufort - If at first you don’t succeed — try, try again. On their fourth effort this month, state underwater archaeologists brought up two cannons Thursday from the Queen Anne’s Revenge shipwreck in Beaufort Inlet. Archaeologists had originally planned to bring up three cannons that day, but because of time left the third on the ocean floor for a future expedition. It’s been a challenge for archaeologists, who had originally set out to bring up eight cannons in June, but because of poor weather conditions had to cancel previous dives. The two cannons hoisted from the site were six-pounders, and make 15 cannons retrieved from the site since its discovery in November 1996, according to Sarah Watkins-Kenny, chief conservator for the project. She said 27 cannons have been discovered at the site so far.